My reading over the past few days has been something of a crazy quilt -a bit of this, another bit of that. After reading a book with the scope and style of The Orchardist, it's difficult for me to settle into something else. One of the things I'm really enjoying about my new local library are the daily bins of used books. Their trade paperbacks are only 50 cents, and I've already picked up several things to add to my library. 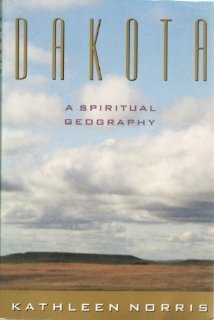 Earlier this week I found a copy of Dakota, A Spiritual Geography, by Kathleen Norris. This was one of the first creative nonfiction books I ever read, (back in the mid-1990's) and it helped me fall in love with the genre. So I was happy to grab it up, especially at that price. If there's anything worth calling theology, it is listening to people's stories, listening to them and cherishing them. This quote, from Mary Pellauer, a feminist author and scholar, heads a chapter entitled The Holy Use of Gossip, in which Norris writes about the role of gossip which seems pervasive in small town life. "Gossip done well," she contends, "strengthens communal bonds." Norris' definition of gossip is different than the way most of us have come to think of it - the whispered rumors of a marriage on the rocks or a husband's out-of-control drinking, even the titillating headlines on celebrity magazines we peek at while on line at the checkout counter. The word "gossip" actually derives from the words that mean God and sibling, and originally meant "akin to God." In fact, a "gossip" was used to describe someone who acted as a sponsor at a person's baptism, someone who "helped give a name" to another. Antecedents of the word are "gospel," "godspell," and "sabha" (a village community). Gossip then (if used correctly) can be a way of sharing our human story, of giving a name to the things that define us. And these stories, by Pellauer's definition, can be called part of the wisdom and study of God's precepts in the real world. Notice also that Pellauer talks about not only listening to people's stories, but cherishing them. I talk a lot about the importance of story - our individual stories, and our collective story as a nation, a gender, a vocational group. I read memoir upon memoir as a way of hearing all kinds of stories, and cherish each one for the impression it leaves in my mind and heart. But I think cherishing one another's stories has a real life application as well, beyond the effect of words on a page. Norris talks about this so well in Dakota, how the folks in her small town of Lemmon, South Dakota, express their solidarity through gossip or shared story. The plight of a young family with a seriously ill child spreads quickly - but so does the response of people bringing food, sitting with the other children in the family, gathering in prayer circles. The stories of the town drunk who either undergoes a miraculous conversion OR loses everything are equally morally instructive. "Gossip - or Story - is theology translated into experience." In the patchwork of stories that make up the crazy quilt of our lives, there is something almost sacred about the tales we share with one another and take into our hearts.